So here is what I did. I took a piece of poster board and made 8 columns--one column for a specific part of the day. Then I went out to Google images and searched for pictures that would coordinate with the time of day. I printed out the pictures and then printed out a group of children. I glued the pictures to the board. I then used contact paper to cover the board. I like the strength of contact paper, especially when I will be moving the schedule from room to room with us. I then got some Velcro and put one tab on each time of the day, and one on the group of people. We then moved the group to the different sections throughout our day. How did it work? Actually, I think it was very helpful. The children came in very "upset." 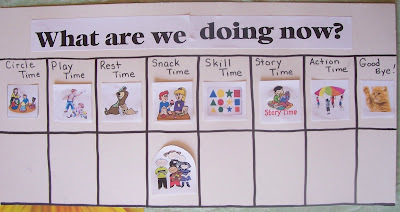 I introduced our schedule right away, showing the pictures, explaining the different times of the day, and moving the group around so they could see. Then we stuck our group on Circle Time and began our day. During play time they started to ask. We walked over to the schedule, took a look at it and they were okay each time. Every time I moved the group I made a big deal out of it. I really think it helped them to see that the "end was in sight." I can't tell you how happy mom was to see them come out of school with a smile instead of a tissue. Was it all the schedule, or are they adjusting? No way to tell for sure, but it was nice for us to actually see them enjoying themselves--even interacting with the others. I think we turned a corner. Awesome idea. I like the way that the schedule reads left to right like we want them to learn for books! I like this idea too. I have used other methods of helping kids who can't seem to make the transition but this one makes so much sense. Thanks for reading and I'm glad that you like the schedule. I got some of my pictures from Microsoft Clipart online. They do have acatual photographs too, sometimes it's just difficult finding one to mathch your subject. I have also found schedules where teachers have taken pictures of their actual class during the day and used those photos for the schedule.